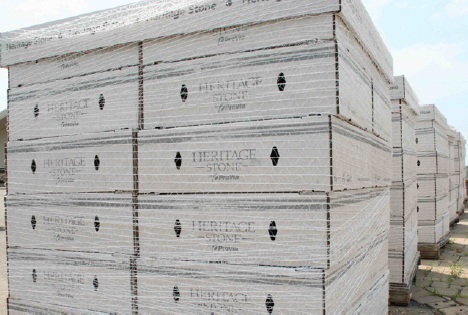 Interstate Container Cambridge offers strong, water-resistant and wax-alternative recyclable corrugated boxes to meet Heritage Stone’s packaging needs. 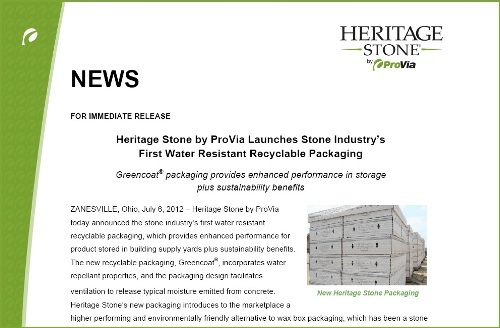 Heritage Stone by ProVia, a building products manufacturer, adopts GREENCOAT® recyclable corrugated packaging to replace previously predominant unrecyclable paraffin wax-based packaging. GREENCOAT® eco-friendly packaging solution maintains needed barrier properties and offers ProVia enhanced performance for storing products in building supply yards. Equipped with a ventilation system, the wax-replacement box’s packaging design ensures concrete moisture expulsion to maintain water repellant characteristics. Heritage Stone by ProVia, established in 1984, manufactures high quality entry-door systems, energy-efficient windows, polymer vinyl siding and artfully-crafted manufactured stone. The company is headquartered in Sugarcreek, Ohio, ProVia. ProVia company team of 500 people offers building products to most of the United States. Interstate Container Cambridge in Cambridge, MD, and sister-company Interstate Container Columbia in Columbia, SC manufacture GREENCOAT® corrugated packaging. The award-winning and FBA-certified GREENCOAT® boxes are compostable, 100% recyclable and repulpable. GREENCOAT® boxes withstand high exposure to moisture and shifts from cold-to-hot environmental conditions, as well as rough handling. The wax-free corrugated box offers a durable packaging solution with improved dry strength for long transportation and storage. Wax-free GREENCOAT® boxes are easier to glue and offer the same strength as traditional cascaded wax boxes and curtain coated wax boxes without the carbon footprint. GREENCOAT® boxes are cost neutral to current wax packaging with Interstate Container controlling 100% of GREENCOAT® box manufacturing process. Additionally, the sustainable box cuts landfill disposal fees, and customers profit from cost savings. Interstate Container plants in Cambridge, MD and Columbia, SC manufacture innovative eco-friendly wax-free GREENCOAT® corrugated packaging. GREENCOAT® wax-alternative boxes pack poultry, meat, seafood, and fresh produce, floral and other refrigerated and frozen products.